2. PPA-95 /18-19 Friday, April 5, 2019 IN REGARD TO THE APPLICATION SUBMITTED BY THE WEST BENGAL STATE ELECTRICITY DISTRIBUTION COMPANY LIMITED (WBSEDCL) FOR APPROVAL OF POWER PURCHASE AGREEMENT EXECUTED ON 25.01.2019 BY AND BETWEEN THE WEST BENGAL STATE ELECTRICITY DISTRIBUTION COMPANY LIMITED (WBSEDCL) AND THE DAMODAR VALLEY CORPORATION (DVC) FOR PURCHASE OF 204 MW POWER FROM RAGHUNATHPUR THERMAL POWER STATION, PHASE - I BY WBSEDCL, FOR A PERIOD OF THREE YEARS FROM THE DATE OF COMMENCEMENT OF SUPPLY AT THE REGULATED PRICE DETERMINED BY CENTRAL ELECTRICITY REGULATORY COMMISSION (CERC) IN TERMS OF REGULATIONS 7.8.1, 7.8.2 AND 7.8.3 OF THE WEST BENGAL ELECTRICITY REGULATORY COMMISSION (TERMS AND CONDITIONS OF TARIFF) REGULATIONS, 2011, AS AMENDED. 3. OA-248/16-17 Monday, April 1, 2019 IN REGARD TO AN APPLICATION SUBMITTED BY WEST BENGAL STATE ELECTRICITY DISTRIBUTION COMPANY LTD FOR INVESTMENT APPROVAL FOR AN ESTIMATED COST OF RS. 278.72 CRORE TO IMPLEMENT THE INTEGRATED POWER DEVELOPMENT SCHEME COVERING 13 NOS. 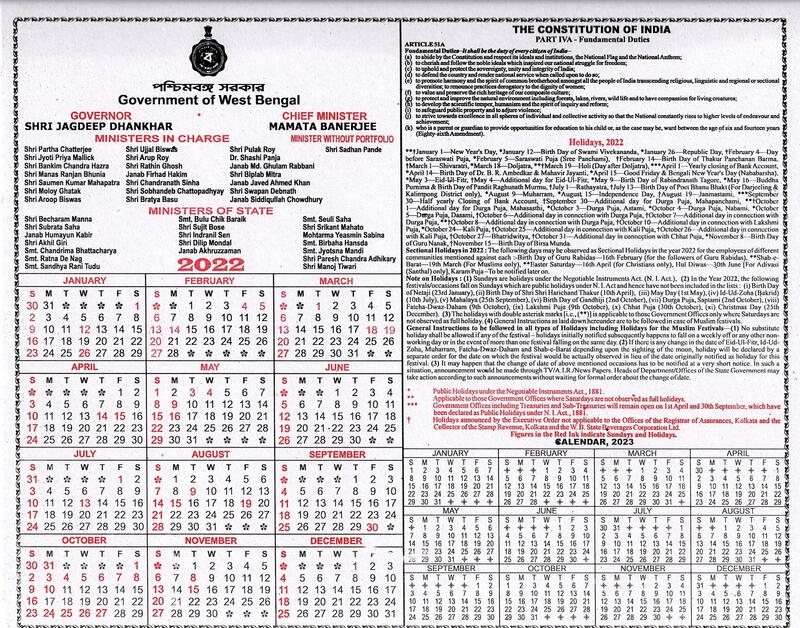 OF TOWNS IN 2 (TWO) REGIONS IN THE STATE OF WEST BENGAL IN TERMS OF REGULATION 2.8.2.3 OF THE WEST BENGAL ELECTRICITY REGULATORY COMMISSION (TERMS AND CONDITIONS OF TARIFF) REGULATIONS, 2011, AS AMENDED. 4. OA-236/16-17 Tuesday, March 5, 2019 IN REGARD TO THE PETITION SUBMITTED BY WEST BENGAL STATE ELECTRICITY TRANSMISSION COMPANY LIMITED (WBSETCL) FOR APPROVAL OF CAPITAL EXPENDITURE OF RS. 422.65 CRORE FOR IMPLEMENTATION OF 4 NOS. OF TRANSMISSION SCHEMES IN TERMS OF REGULATION 2.8.2.3 AND PARAGRAPH 4.1 (VI) OF SCHEDULE-2 OF THE WEST BENGAL ELECTRICITY REGULATORY COMMISSION (TERMS AND CONDITIONS OF TARIFF) REGULATIONS,2011, AS AMENDED FROM TIME TO TIME. 10. OA-273/18-19 Thursday, February 21, 2019 APPLICATION REGARDING ADJUDICATION OF DISPUTE ON ACCOUNT OF ERRONEOUS BILLING BY DAMODAR VALLEY CORPORATION AT RETAIL SUPPLY TARIFF TO WEST BENGAL STATE ELECTRICITY DISTRIBUTION COMPANY LIMITED IN CONTRARY TO THE PROVISIONS OF ELECTRICITY ACT, 2003. 11. OA-272/18-19 Thursday, February 21, 2019 APPLICATION REGARDING ADJUDICATION OF DISPUTE ON ACCOUNT OF ERRONEOUS BILLING BY DAMODAR VALLEY CORPORATION AT RETAIL SUPPLY TARIFF TO INDIA POWER CORPORATION LIMITED IN CONTRARY TO THE PROVISIONS OF THE ELECTRICITY ACT, 2003. 12. OA-268/17-18 Wednesday, February 20, 2019 APPLICATION UNDER SECTION 86(1 )(F) OF THE ELECTRICITY ACT, 2003 FOR DIRECTION UPON WBSEDCL (RESPONDENT) TO PAY RS. 253.18 LAKH ALONG WITH THE INTEREST @1.25% TO NIPPON POWER LIMITED (PETITIONER). 13. OA-245/16-17 Wednesday, February 20, 2019 APPLICATION FOR ISSUE OF PRACTICE DIRECTIONS TO ENABLE CONSUMERS TO OBTAIN 'NO DUES CERTIFICATE' FROM EXISTING LICENSEE PRIOR TO SWITCHING OVER/ EXERCISING THE CHOICE OF OPEN ACCESS FROM ANOTHER PARALLEL LICENSEE I SUPPLIER. 14. WBERC/PPA-94 /18-19 Friday, February 15, 2019 IN REGARD TO THE APPLICATION SUBMITTED BY WEST BENGAL STATE ELECTRICITY DISTRIBUTION COMPANY LIMITED (WBSEDCL) FOR APPROVAL OF POWER PURCHASE AGREEMENT EXECUTED ON 08.01.2019 BETWEEN TATA POWER TRADING COMPANY LIMITED (TPTCL) AND THE WEST BENGAL STATE ELECTRICITY DISTRIBUTION COMPANY LIMITED (WBSEDCL) FOR PURCHASE OF HYDRO ELECTRIC POWER BY WBSEDCL FROM THE DAGACHHU HYDRO POWER CORPORATION LIMITED, A COMPANY DULY INCORPORATED UNDER THE LAWS OF BHUTAN, FROM THE DATE OF SUPPLY OF POWER TO 28TH, FEBRUARY.2023 THROUGH TPTCL IN TERMS OF REGULATIONS 2.1.5(1), 7.4.1 AND 7.8.3 OF THE WEST BENGAL ELECTRICITY REGULATORY COMMISSION (TERMS AND CONDITIONS OF TARIFF) REGULATIONS, 2011, AS AMENDED. 17. WBERC/PPA-92 /18-19 Friday, February 1, 2019 IN REGARD TO THE APPLICATION SUBMITTED BY WEST BENGAL STATE ELECTRICITY DISTRIBUTION COMPANY LIMITED (WBSEDCL) FOR APPROVAL OF POWER PURCHASE AGREEMENT EXECUTED ON 29.10.2018 BETWEEN PTC INDIA LIMITED (PTC) AND WEST BENGAL STATE ELECTRICITY DISTRIBUTION COMPANY LIMITED (WBSEDCL) FOR PURCHASE OF 100 MW POWER FROM JAi PRAKASH POWER VENTURES LIMITED FROM APPOINTED DATE FOR A PERIOD OF 3 (THREE) YEARS IN TERMS OF REGULATIONS 2.1.3, 7.4.1 AND 7.8.3 OF THE WEST BENGAL ELECTRICITY REGULATORY COMMISSION (TERMS AND CONDITIONS OF TARIFF) REGULATIONS, 2011, AS AMENDED. 18. WBERC/PPA-91 /18-19 Friday, February 1, 2019 IN REGARD TO THE APPLICATION SUBMITTED BY WEST BENGAL STATE ELECTRICITY DISTRIBUTION COMPANY LIMITED (WBSEDCL) FOR APPROVAL OF POWER PURCHASE AGREEMENT EXECUTED ON 29.10.2018 BETWEEN PTC INDIA LIMITED (PTC) AND WEST BENGAL STATE ELECTRICITY DISTRIBUTION COMPANY LIMITED (WBSEDCL) FOR PURCHASE OF 100 MW POWER FROM JHABUA POWER LIMITED FROM APPOINTED DATE FOR A PERIOD OF 3 (THREE) YEARS IN TERMS OF REGULATIONS 2.1.3, 7.4.1 AND 7.8.3 OF THE WEST BENGAL ELECTRICITY REGULATORY COMMISSION (TERMS AND CONDITIONS OF TARIFF) REGULATIONS, 2011, AS AMENDED. 20. OA-277/18-19 Tuesday, January 22, 2019 IN REGARD TO THE APPLICATION SUBMITTED BY WEST BENGAL STATE ELECTRICITY DISTRIBUTION COMPANY LIMITED (WBSEDCL) FOR ISSUANCE OF APPROPRIATE ORDER FOR PROVISION OF INSTALLATION OF SINGLE PHASE EXPORT- IMPORT TYPE METER FOR NET METERING PURPOSE FOR REMOVAL OF DIFFICULTIES. 21. A-6/14 Monday, December 31, 2018 IN REGARD TO THE DIRECTION OF THE GOVERNMENT OF WEST BENGAL IN THE DEPARTMENT OF POWER & NES UNDER SECTION 108 OF THE ELECTRICITY ACT, 2003 FOR TRANSFER OF DISTRIBUTION AND TRANSMISSION FUNCTIONS OF THE DURGAPUR PROJECTS LIMITED (DPL) TO WEST BENGAL STATE ELECTRICITY DISTRIBUTION COMPANY LIMITED (WBSEDCL) AND WEST BENGAL STATE ELECTRICITY TRANSMISSION COMPANY LIMITED (WBSETCL) UPON RESTRUCTURING OF DPL IN TERMS OF NOTIFICATIONS NO. 319/PO/O/C-IV/1E-60/13 (PART-VA) DATED 08.12.2017, 328/PO/O/C-IV/1E-60/13 (PT-VA) DATED 26.12.2018 AND 332-PO/O/C-IV/IE-60/13(PART-VA) DATED 31.12.2018. 28. WBERC/OA-57/09-10 Thursday, November 22, 2018 IN RE THE APPLICATION SUBMITTED BY INDIA POWER CORPORATION . LIMITED (IPCL) FOR APPROVAL OF FINAL PROJECT COST TOWARDS CONSTRUCTION OF 220/33 KV SUB-STATION AT J. K. NAGAR, DISTRICT BURDWAN WITH ASSOCIATED TRANSMISSION AND DISTRIBUTION LINES AND SYSTEMS (PHASE-I) IN TERMS OF REGULATION 2.8.4.1 OF THE WEST BENGAL ELECTRICITY REGULA TORY COMMISSION (TERMS AND CONDITIONS OF TARIFF REGULATIONS), 2011 AS AMENDED AND REGULATIONS 2.5.1 AND 2.6.1 OF. THE. WEST BENGAL ELECTRICITY REGULATORY COMMISSION (CONDUCT OF BUSINESS) REGULATIONS, 2013.